In 2010, a landmark book, Merchants of Doubt, showed how a small group of prominent scientists with connections to politics and industry led disinformation campaigns denying established scientific knowledge about smoking, acid rain, DDT, the ozone layer and global warming. Written by Dr. Naomi Oreskes, Harvard science historian, and NASA historian Erik Conway, Merchants was reviewed by Bill Buchanan of The Christian Science Monitor as “the most important book of 2010” and by The Guardian’s Robin McKie as “the best science book of the year.” It was followed by the 2014 documentary of the same name, also widely seen and reviewed. The research showed how the disinformation tactics of the tobacco companies in the 1960s to undermine the scientific link between smoking and lung cancer served as a model for subsequent oil company tactics suppressing climate change science. Following the U.S. Surgeon General’s landmark report on smoking and lung cancer in 1964, the government legislated warning labels on cigarette packages. But a tobacco company executive from Brown & Williamson had a brainwave: people still wanted to smoke and doubt about the science would give them a ready excuse. Tobacco industry executives never directly denied the mounting evidence that cigarettes were linked to lung cancer. Instead, they stated publicly that the science was controversial. In this way they managed to delay regulation and lawsuits until the 1990s. When the global warming science began to emerge in the 1980s, the oil industry employed the same deceptions. The whole focus was now on creating doubt in the minds of the politicians, the media and the public about whether we really know for sure that climate change is a problem. Doubt, as the tobacco industry had learned so profitably, delays action. When the IPCC was formed in 1988 and began documenting and publicizing the impacts of climate change, the climate disinformation campaign grew more intense. Big Oil employed the same tactics, arguments, vocabulary and PR firms that the tobacco companies had used to cast doubt on the dangers of smoking 25 years earlier. The American Petroleum Institute convened a Global Climate Science Communications Team in 1998 to devise a plan targeting the media, schools, government officials, Congress and other influential groups. Media “understands” (recognizes) uncertainties in climate science. Those promoting the Kyoto treaty on the basis of extent science appears [sic] to be out of touch with reality. Marc Morano (Bachelor PoliSci) from Climate Depot, 30 TV appearances. Tim Phillips (Bachelor PoliSci) from Americans for Prosperity, 7 appearances. Fred Singer (physicist) from the Science and Environmental Policy Project, 8 appearances. James Taylor (lawyer), from the Heartland Institute, 8 appearances. Although these men lack credentials in climate science and have been widely exposed as imposters, the major cable TV and networks still give them credibility on their free media platforms. The corporate media has thus given a relatively small group of science deniers with financial connections to the fossil fuel industry immense influence in sowing doubt on the scientific consensus of human-made climate change. In 2016, the Union of Concerned Scientists reported that “an in-depth analysis of eight leading fossil fuel companies finds that none of them has made a clean break from disinformation on climate science and policy.” The companies included were ArchCoal, BP, Chevron, ConocoPhillips, Consol Energy, ExxonMobil, Peabody and Shell. The industry has responded to the spotlight by intensifying propaganda through the agents below. The Koch Brothers: The multibillionaire industrialists Charles and David Koch are two of the most powerful people in the global oil industry, owning Koch Industries, a $100-billion conglomerate employing 100,000 people in 60 countries. They control 1-2 million acres of Alberta’s tar sands. The Kochs, bigger than either of the Democratic or Republican parties, manipulate both. A major focus of Koch money has been to ensure that no legislation is passed to curb the burning of fossil fuels. The brothers have gained pledges from 170 members of Congress that they will never support a tax on carbon. While attacking legitimate climate scientists, the Kochs were funding prominent pseudo-climate-scientists. ExxonMobil: In 2015, we learned from its own research that Exxon has known since 1980 that global warming is real. Kert Davies, former research Director of Greenpeace USA, revealed through ExxonSecrets.org that, meanwhile, ExxonMobil’s climate change denial funding totaled at least $33 million during the period 1997-2016. “At least $33 million” because much of the funding has been channeled through dark identity scrubbing groups such as Donors Trust and Donors Capital. Secret funding by coal companies: In April 2017, Peabody Energy, the country’s largest investor-owned coal company, declared bankruptcy, following Arch Coal and Alpha Natural Resources. In all three cases, court-ordered disclosures revealed creditors well known as climate science deniers. These included Chris Horner, who regularly disparages climate science on Fox News and has called for investigations of IPCC and NASA scientists. Whitehouse was one of the first in Congress to propose a civil case, similar to the racketeering suit Bill Clinton brought against the tobacco industry, against fossil-fuel companies for deliberately misleading the public on climate science. We have established that the decades-long blocking and lying about scientific evidence on the dangers of human-caused global warming has been deliberate. So the question arises, how many people have been, or will be, hurt or killed by climate change? A 15-author 2016 report from the U.S. Global Change Research Program warns that people suffering chronic diseases such as Alzheimer’s, asthma, chronic obstructive pulmonary disease, diabetes, cardiovascular disease, mental illness and obesity are being threatened by climate change. A global estimate was supplied by an independent report commissioned by 20 countries in 2012 to study the human and economic costs of climate change. The DARA study wrote that it linked 400,000 deaths worldwide to climate change each year, projecting deaths to increase to over 600,000 per year by 2030… Heat waves kill many, to be sure, but global warming also devastates food security, nutrition and water safety. Since mosquitoes and other pests thrive in hot, humid weather, scientists expect diseases like malaria and dengue fever to rise. Floods threaten to contaminate drinking water with bacteria and pollution. When the report looked at the added health consequences from burning fossil fuels – aside from climate change – the number of deaths jumps from 400,000 to almost five million per year. Carbon-intensive economies see deaths linked to outdoor air pollution, indoor smoke from poor ventilation, occupational hazards and skin cancer. When disinformation known to be false is systematically used to deny dangerous realities that harm public health and kill millions of people, the deception clearly crosses the line to become a crime against humanity. The 2014 IPCC 5th assessment Summary for Policy Makers, along with previous IPCC assessments, is solid proof of the unprecedented crime represented by today’s level and rate of increase in atmospheric greenhouse gas pollution. It is definite because policy makers representing all world governments sit on the IPCC Panel and before the assessment can be published, they scrutinize the assessment line-by-line for government approval. As governments from high-emitting countries continue – against the will of their own citizens and of the nations most vulnerable to climate change – to allow the global climate catastrophe to unfold, they simply cannot say that they did not know. Participation in formulating the IPCC summaries makes the large GHG-polluting national governments undeniably culpable for their continued lack of action to bring about a rapid decline in global emissions. Not only have they betrayed the IPCC science. While doing so, they have pampered the lucrative fossil fuel industry with trillions of dollars in subsidies worldwide. But worst of all they have failed to protect their citizens – now and for future generations. This is the crime of all time. 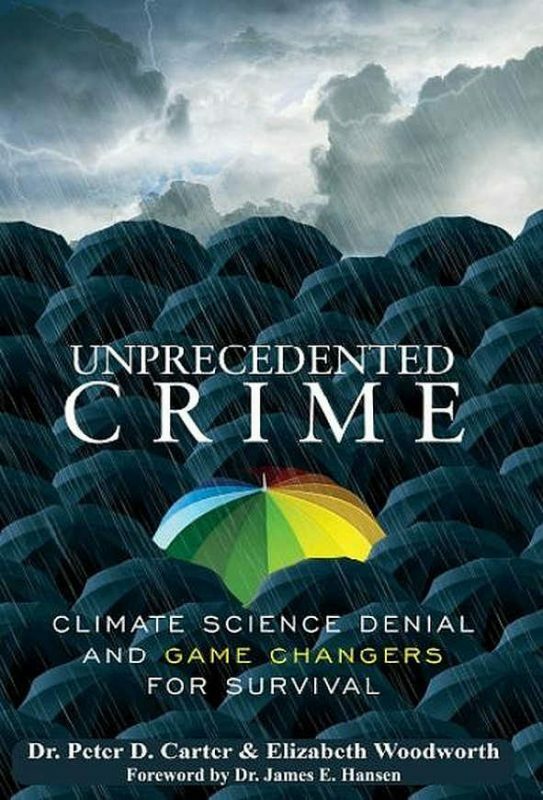 Excerpted with permission from Unprecedented Crime: Climate Science Denial and Game Changers for Survival by Elizabeth Woodworth and Dr. Peter Carter (Clarity Press). Elizabeth Woodworth is a writer on climate change science and activism, co-author of Unprecedented Climate Mobilization and co-producer of the COP21 video A Climate Revolution for All. Dr. Peter Carter is founder of the Climate Emergency Institute. He served as an expert reviewer for the Intergovernmental Panel on Climate Change (IPCC) fifth climate change assessment in 2014. He is a former family and emergency medicine practitioner.